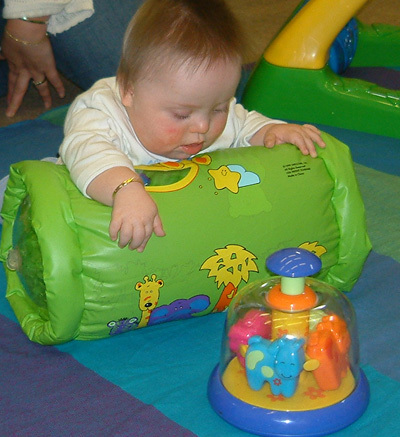 Children with Down syndrome develop motor skills more slowly than many other children. A number of studies have explored their motor development, and a few have begun to evaluate specific physical therapies. 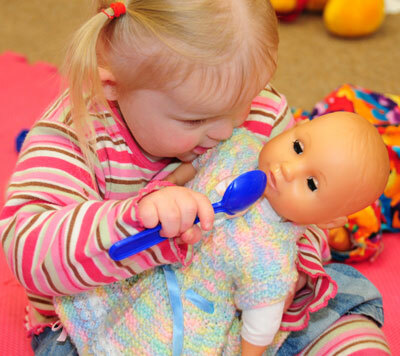 It is increasingly recognised that motor skills effect cognitive development. More research is needed to develop and explore effective interventions to improve motor and cognitive development for children with Down syndrome. Motor development is complex and controlled by the brain. As babies and children move, from early reaching for a toy, to picking up a cup, using a knife, fastening buttons and writing with a pen (fine motor skills needing hand control) and from rolling, to sitting, crawling, standing, walking, running and jumping (gross motor skills needing balance) the brain is learning how to control each movement more quickly, smoothly and precisely. To control any movement, the brain has to process complex incoming information (for example from eyes, from limbs, from vestibular system) and use this to control movements in real time. Over time, the brain stores ever better motor control plans for each movement as the child practises the movement. Children with Down syndrome may have some physical differences in the resting state of their muscles, in the stretchiness of their ligaments at joints and in bone lengths which affect learning to move but the brain learns to accommodate to these and movement increases strength and encourages development in the muscles and in joint function. Improving movement means providing as much opportunity as possible to practice that movement. Looper, J. & Ulrich, D.A. (2010) Effect of treadmill training and supramalleolar orthosis use on motor skill development in infants with Down syndrome: a randomised clinical trial. Physical Therapy, 90, 382-390.